Annual Reviews Are A WasteEliminate The Muda! « Why Can’t I Save Money? It is that time of year again, time for the dreaded annual review. There are only a few basic ways that companies approach these. At its worst, a manager fills out a form filling out a set of standard questions about your performance. If you have a good manager, there should be no surprise. She will simply repeat the perception that she has provided you already. Next comes what I call the regurgitated review. 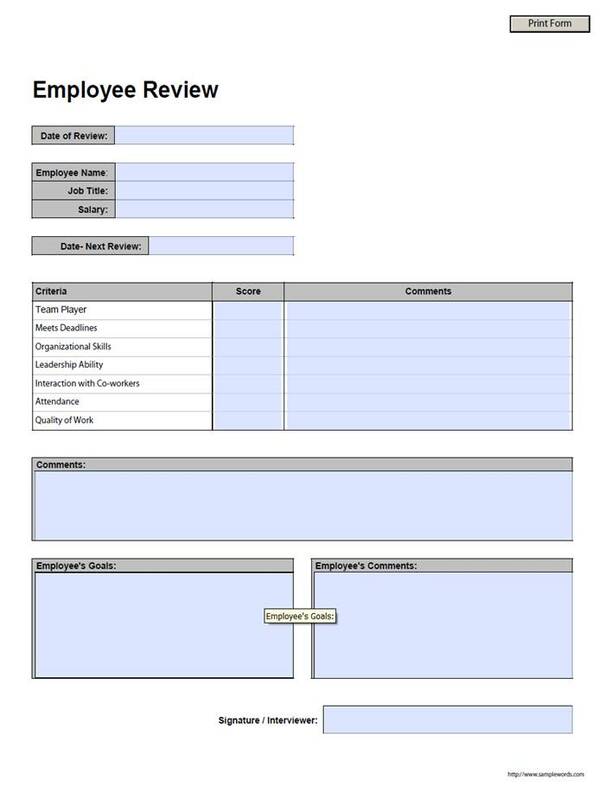 This is where the employee has the opportunity to fill out a standard form revealing their perception of their performance over the previous year. I call it regurgitated because whatever you write is often the basis if not directly copied and pasted into your annual review conducted by your manager. Again, this should be no surprise. Recently, I sat with a group of people from several companies when the subject of annual reviews was the topic of discussion. It was quickly apparent that the overall view of the process was negative, with the exception of the fact that some generous raises were the result in years past. 1) Time – Of those that had to fill out self-assessments, the average was about 3.5 hours of effort to complete their portion of the review. Of those that were supervisors, they reported 2-4 hours per review. Imagine how much time is spend in Fortune 500 companies collectively! 2) Disconnect – Generally, each participant in our discussion use to believe at one point that the quality of their review would have a direct correlation to the size of their raise or bonus. However, the recent business slowdown proved otherwise. For a number of these people, while their personal performance remained steady or actually increased and improved their pay remained flat or was even reduced. With one exception, pay for performance didn’t apply in 2008! 3) It is too late! – Assuming there is a performance concern with a given employee an annual review is not the time or place to address it. It is like managing a business through a rear-view mirror. Any issues should be addressed in a timely manner. As a manager, what I really care about is not what you have done for me in the past, it is what you will do for me in the future. We shouldn’t be wasting out time with annual reviews, we should be focusing on previews. But I would like to go one step further. With the dynamically changing landscape that many businesses face, I’d like to do quarterly or even monthly previews. Each employee should list what they expect to accomplish in the next period. How much are they going to sell, how many papers are going to be completed, or how few mistakes will be made. An annual or more frequent preview would be a great tool to establish clear understanding of expectations of an employee and the expectations of the resources that a company will provide to support these goals. Previews would help drive performance instead of measuring it after the fact. Previews would render the review obsolete. Readers: Do you have annual reviews and what do you think about the process? What am I missing with the concept of a preview, does the idea have merit? I just had my 6-month review (orientation period) and I wrote something up as did my superviser. We were on the same page, which was nice, and I was given a positive review with a slightly salary increase (think pro-rated 4%). I also attended a focus group on some negative aspects of the company, and performance appraisals were rated terribly. People don’t fully understand the process or how a 3 out of 5 is very good, while 4s and 5s are hard to reach and a 2 is very bed. People also wanted mid-year or quarterly reviews. But imagine making them formal and having to put even more hours towards that! It seemed like an informal review with a review of goals and a look towards the coming months is the best way to go. .-= Daniel´s last blog ..Tried And Tested: Pay Yourself First =-. I think if you’re working closely with your business team the annual review should be superfluous. I shouldn’t have to tell my supervisor what I’ve done for the past year if he was paying attention to my work. However, I’ve never had a manager that actually paid that much attention to what I do so I’m kind of glad they ask me to send them a list of my accomplishments for the year as part of the pre-review process. And like you said, any feedback you receive at this point, good or bad, is too late. We just put in a system at work called performance impact. It actually requires us to do a meeting to discuss expectations for the next six months. It also allows us (and my boss expects this) to put log individual events for our employees. I try to log something for the guys that work for me biweekly. Then at the end of the year, the review writes itself. Takes about an hour and is in a boiler plate format, filled with pertinent moments for the last year. At my job good evaluations don’t mean bonus pay, but they go a long way towards promotion and specialty assignments. I completely agree… total waste of time. In my last job, my boss asked me to write my own review and just signed off on it. .-= Matt SF´s last blog ..If You Have a Blog, You’ve Got Leverage! =-. LLC – Time… We actually have a “game” at work were we calculate the translated $$$ from meetings. One day, we had something starting at 1:00, didn’t get going until 1:30, and because so many people were in attendance – that short delay was easily thousands down the drain. Another problem is relevance. Hand-crafting unique characteristics is hard with cookie-cutter templates. Being early on in my career, lots of N/As down the line I have to come up with “creative” answers to. .-= FinEngr´s last blog ..What’s Wrong With “Green” =-. @Daniel – Informal maybe, but documented for sure. Routine oversight is managements role isn’t it? @David – “the annual review should be superfluous” – Agreed but if it is, doesn’t that mean its really a waste of time? All your points are added proof of my beliefs. @Tracy – Sounds like you have a great plan at work… again if all is “previewed” then is the annual review really necessary? @FinEngr – What prompted this post was a visit to a customer. He had a book on his desk titled something like “1200 perfect phrases for employee reviews.” Kinda undermines the whole thing, don’t you think? I agree with David that you should be working close enough and communicating so it really isn’t shocking to anyone. If anything it could be built up through taking a few months each month by the manager so they don’t have to rehash the whole year off the top of their head. I like your idea of a preview as well… if I had one at the previous job I was at I might’ve stayed. Setting measurable goals is really powerful and a preview would harness that power. Who do you think dreads the reviews more… the employees or the managers? @Ryan – again, if management is engaged with associates and there is always clarity on how well expectations are being met, wouldn’t that preclude the need for a review? I’ve been on both sides. If you have more than one employee its an easy answer, managers dread it more! Lean – Isn’t the annual review more of a necessary evil for the HR department? They need physical documentation so they can fire or promote the individual. It’s all about the law and not getting sued. .-= Financial Samurai´s last blog ..The Most Important Tip For Job Hoppers: Join People, Not Firms =-. @FS – A preview could work just as well! In fact, if there is a performance issue, a preview could be even more effective at supporting why an employee needs to be canned!